How the Life at Play event photo station works. Our interactive, open photo stations go with the flow of your event, permitting your guests to create their own photos, ham it up with our props, ham it up with their friends, see the photos (up to 4) that they have taken and select the one they like most. We will work with you during the planning stage of your event to design your logo and graphics to be printed on your guests' photographs. We will also determine the ideal location of the photo station at your event. Prior to the start of your event, our professional attendants will set up our open photo station and test our equipment to achieve the highest quality of photographs and prints at your location. Our hip and fun photo station with customizable music will draw your guests to come in front of the camera to take amazing pictures. 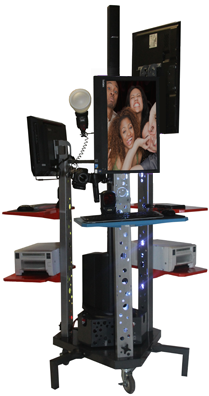 Your guests will be able to view themselves pose and have fun in a large monitor and will be able to take their own photographs by using a wireless remote in their hand. Your guests will be guided out of the photo station to the nearby print station where they will receive their high quality photo print that will include your logo or personal message. Step 6: Repeat step 3 to 5 and have more fun. Our attendants will break down and remove the photo station. Your guests will receive an email thanking them for their attendance and will be invited to the Life at Play website where they can view, download, print and share any of the photographs from your event via social networking websites. They will also have access to order hundreds of amazing photo gifts or simply order more prints.